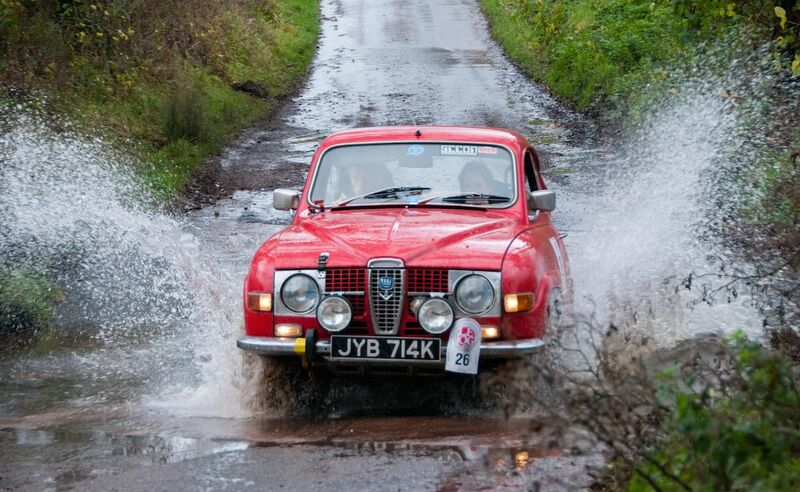 The 21st running of the Land’s End to John O’Groats Classic Reliability Trial and Tour (Le Jog) was staged 5-8 December 2015 in the United Kingdom. Starting in Land’s End, the most westerly point of mainland England, the 4-day Le Jog rally open to cars built before 1986, ended in John O’Groats, the northeastern tip of Scotland. 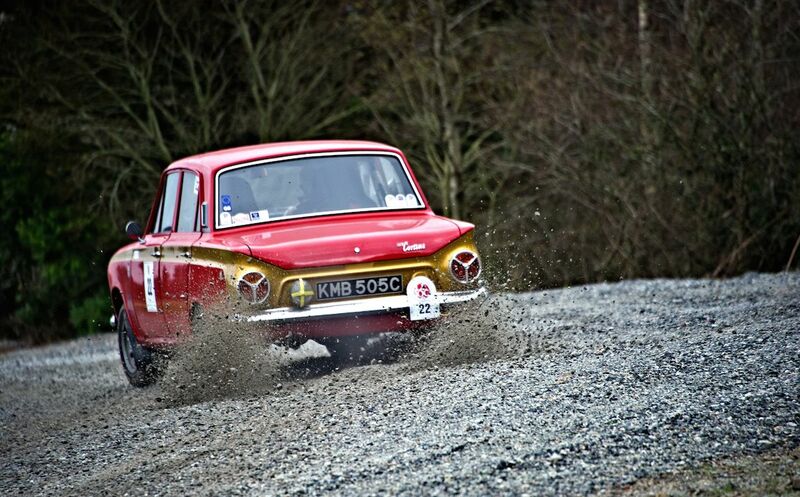 The Historic Endurance Rallying Organisation (HERO) event known as the toughest classic reliability trial in Europe didn’t disappoint in 2015, as the 21th anniversary included features and locations that have become part of Le Jog folklore. The entry list for the 2015 event was very diverse, ranging from a Mark VI Bentley all the way to Porsche 944s from the mid-1980s. As well as this iconic event coming of age, the ten-year stewardship of Peter Nedin had been taken over by the formidable pairing of Guy Woodcock as Clerk of Course with Graham Dance as route planner and assistant Clerk of Course. Their aim was to deliver an event more focused on the endurance side of things. 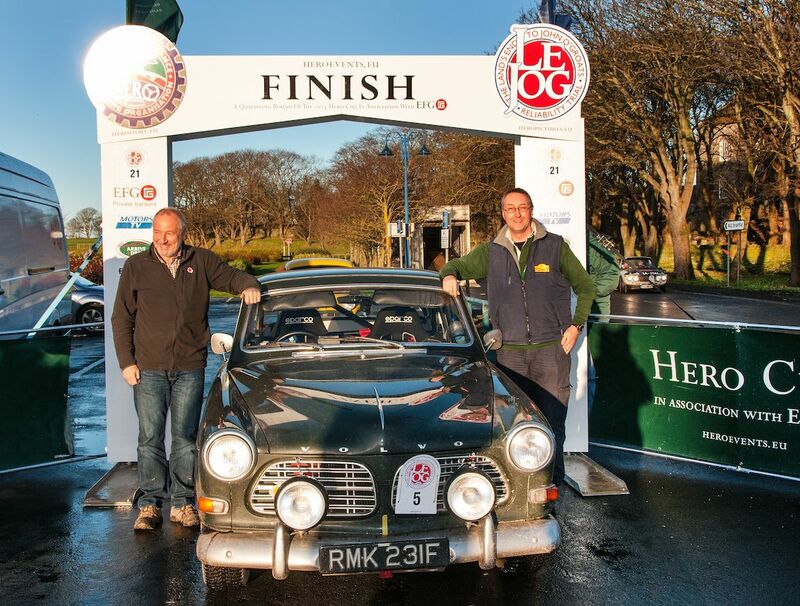 Widely regarded as ‘The Toughest Classic Car Event in Europe’ Le Jog was the final round of two championships – The HERO Cup for Drivers in association with EFG Private Bank and The Golden Roamer for Navigator’s in association with The Basic Roamer Company. The HERO Cup being incredibly close with two drivers, with last year’s winner Paul Crosby separated from second placed Stephen Owens by just one point going into the final round. The prize for the HERO Cup is a week’s sailing on-board the beautiful S/Y Orianda whilst the prize for the Golden Roamer is a paid entry to one of three selected HERO events. An earlier 07:30 start saw crews arriving at Land’s End in darkness. The waves whipped against the headlands in Sennen by over 70 mph gusts of wind as crews headed out into the traditional first test in the grounds of Land’s End. Bob and Sue McClean led the crews away at 07:30 exactly, running as first car on the road in their venerable Rover P4-100. It was a fitting position for the crew as this was their fifteenth Le Jog in the car; no other crew has competed in as many of the events. The 2015 edition saw an influx of newcomers to Le Jog, amongst them were many younger more akin to competing on modern road rallying events. They included Cumbria’s Dan Willan who was partnered by Martyn Taylor in a borrowed Volvo PV544, and Nick Bloxham, son of ex-Motoring News Champion John Bloxham. Another entry have turned historic rallying on its head. The crew of Simon Mellings and Richard Crozier in a Rover 216S — bought and prepared for less than £2000 — showing that the sport need not only be about expensive and rare vehicles. The first morning took crews out via Penzance, Redruth and Truro before arriving at Betty Cottles for lunch. The crew of Dirk and Nick van Praag experienced early problems. They had originally intended to compete in a Lancia Fulvia HF, however this was not to be and the Lancia was substituted for a Mark VI Bentley. The venerable old machine was a little reluctant at the prospect, as a foreign object in her fuel system caused them all manner of problems and eventually forced their retirement. Wales always plays a huge part on the event, the lanes of Devon and Cornwall come a close second to those over the border, but nothing can compare to the intricate and sinewy pieces of tar in the night section. After a two-hour halt at Chepstow, crews were thrown into the infamous Caerwent Military Complex. 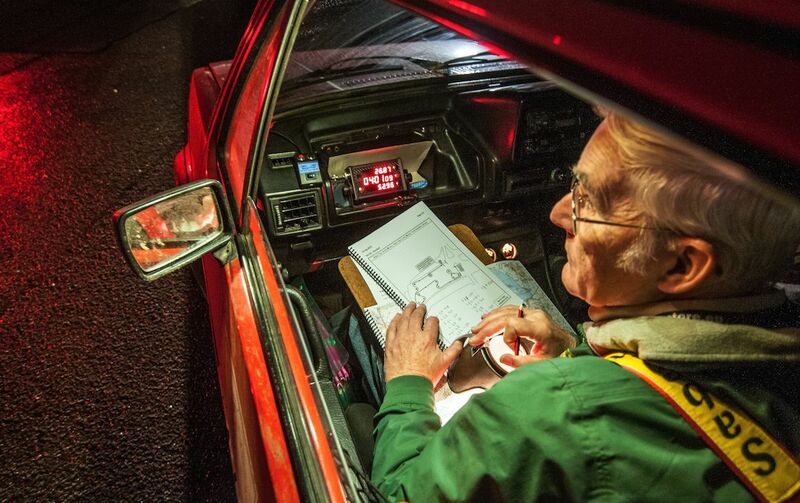 This was the first really stern test of the night and, although relatively short at just 6.45 miles, it contained ninety-eight route instructions to guide competitors around its maze-like interior. Sections through mid-Wales brought the event to a brief halt at Crossgates Filling Station before the first Time Control section. There were fifteen timing points that crews had to visit within a minute of a specified time, with those falling behind the schedule receiving penalties. This may sound relatively straight forward, but the lanes here are narrow and unforgiving and the section requires intense concentration from both driver and navigator. Amongst those who struggled here were 2013 Gold Medal Winners Andrew Buzzard and Robb Lyne, a visit to the scenery halting their up-to-now excellent progress. After leaving the lanes around Clun Forest and pressing north, a short link section brought Le Jog to Long Mynd. A further six controls over the steep and unfenced lanes before the final action of the night, with four timing points interspersed with four passage checks. Only two crews cleaned the TC section — past Gold Medal winners Andy Lane and Iain Tullie and Mellings and Crozier, with Lane and Tullie finding their new Volvo 123GT superb in the lanes. A brief overnight halt at Telford heralded the second day. Venturing through the north Midlands via sections through Uttoxeter, Tissington and Hathersage saw Le Jog journey along the spine of the UK. The Pennines, a regularity section to the south of Stocksbridge, took Le Jog into Holmfirth and the stunning Yorkshire Dales. 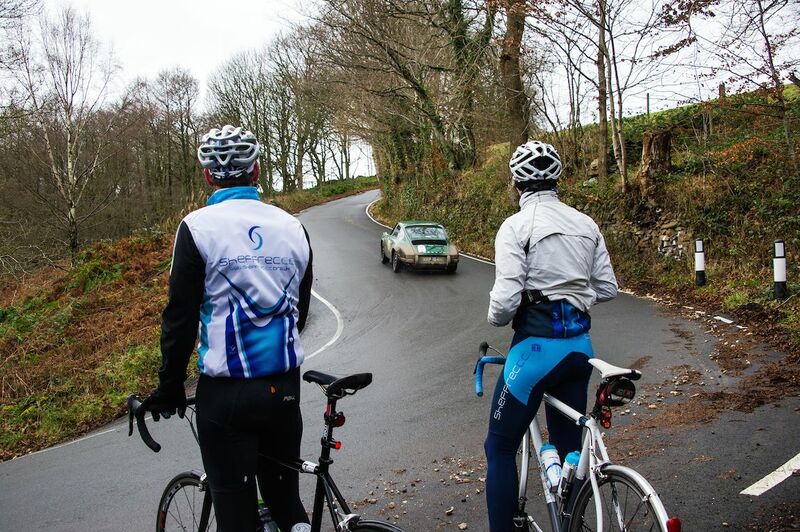 Even with a massive deluge, the scenery and roads in this area have to be seen to be believed. (Such was the strength of the downpour that a waterfall at Malham Tarn was apparent for the first time in living history). The roads in Littondale resembling a stream from the rain deposited during the day. A wrong turn from experienced crew Tim Lawrence and Alan Pettit in an MG B saw them stall in a section of water so vast it resembled a duck pond. The pair had to push their stricken vehicle out, the interior receiving a soaking and leaving the pair with damp seats — in more than one sense of the phrase! Classic sections of North Yorkshire and Northumberland road brought the event into Slaley Hall for the overnight halt before the final push to John O’Groats. One of the regularities just before the overnight halt being named this. As an indication to newcomers that the event is a truly mammoth undertaking, many commented that they were glad Stanhope Ford wasn’t used this year, as a local had sent an image of the ford and the River Wear was storming through and almost certainly unusable. Following a good night’s rest, a driving test in the grounds of Slaley got the final day’s action underway. As is custom, the final legs are the real challenge of the event with no less than twenty-six hours elapsing from crews leaving Slaley to crossing the finish line in Wick. Lane and Tullie were truly imperious, as they constantly cleaned sections other crews found difficult. Willan and Taylor were pushing them hard should they make a slip. There were several twists in the battle for the HERO Cup — Paul Crosby and Andy Pullan’s Porsche 911 clutch cable developed a problem. Crosby’s combatant for the cup, Stephen Owens lent him one to keep him going, an unselfish act that would reap dividends later for the Yorkshireman. The skill and foresight of the organising team was brought into play as they had a sudden closure of the Forth Road Bridge to contend with — many crews commented on the professionalism displayed as an almost immediate amendment was produced — with full colour maps and roadbook adjustments to boot to keep the event on track. Passing into the Highlands, the weather improved slightly, as crews took in Kinloch Rannoch and Inshriach Forest on the way to the final major halt of the event at Coylumbridge. Many competitors took advantage of the break here to rest, as they would leave here knowing they still had a further eleven hours of competitive driving in front of them. The longest regularity section of the event ensued. Seventy-four miles and one hundred and twenty instructions took crews around The Loch Ness Monster, difficult at the start of an event but made even more arduous with the onset of fatigue. It was here that Owens reaped his reward for lending Crosby a clutch cable. Despite the pair being embroiled in a tussle for The HERO Cup, a faulty rotor arm was replaced and an ignition coil changed on Owens’ vehicle by Crosby. Stephen Owens was a little cautious throughout the rest of the event but able to retain his Gold Medal status despite the problems, as Crosby displayed equal sportsmanship to Owens’ earlier gesture. 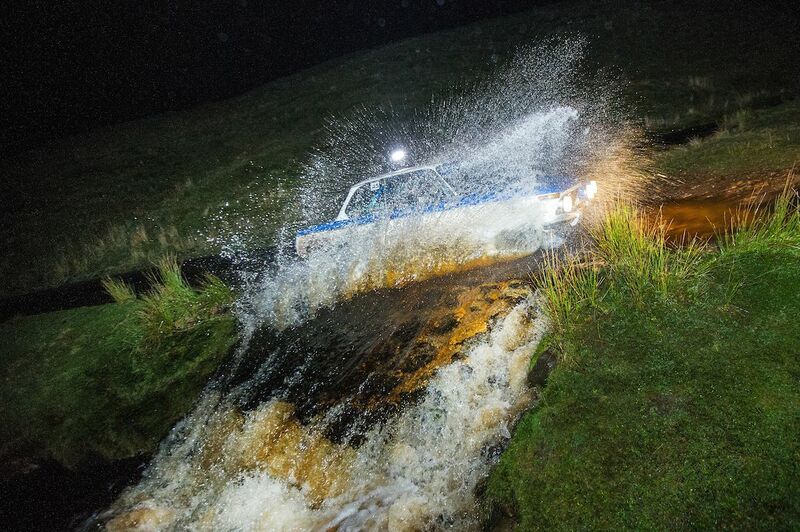 The final sections of the event were based on the East Coast of Scotland, with many passes being used to bring crews into John O’Groats. The final regularity brought some surprises. Using the topography and his map skills to the fore, Graham Dance put in two very testing controls that saw some crews drop time here, just before reaching the very north-east of the UK. A final test saw three crews take Gold Medal status, Andy Lane and Iain Tullie, Stephen Owens and Nick Bloxham and Simon Mellings and Richard Crozier. Paul Crosby retained his class lead by a huge margin despite mechanical problems earlier in the event, as he pipped Stephen Owens by just one point to retain the HERO Cup. In the Golden Roamer for navigators, Andy Pullan sealed a fine championship win. He takes the prize of a paid entry on one of three HERO events, a prize he intends to share with his Father, Nick in their Hillman Imp. It seems that a return to the endurance side of things has been very well received at the 2015 Le Jog Rally. The event will return in 2016 where it will be the final round of The HERO Cup in association with EFG Private Bank and Zenith Watches. Similar to 2014, Sports Car Digest also documented the 2015 Le Jog Rally, with photographers Francesco Rastrelli and Roberta Roccati offering a wonderful selection of images. We split up Francesco and Roberta’s pictures into two galleries. The first gallery starting below features our favorite images, all displayed in the full-width view of Sports Car Digest, while the second gallery can be found on the last page of the article and gives a comprehensive view of all photographs.